Sweet potatoes are one of my favorite foods. I love them in any form-roasted, in soup, as fries, and even on my tostadas. I made a pan of roasted sweet potatoes last week for lunch and had some leftovers. I was going to stick them in the refrigerator for later, but instead I made sweet potato rosemary biscuits for dinner. Homemade biscuits are not hard to make and taste so much better than the canned version, in my opinion. These drop biscuits are especially easy to make. You don’t have to roll out the dough or fuss with cutting them and they take less than 20 minutes to bake. The roasted sweet potatoes, garlic, and rosemary add the perfect punch of flavor and color to these buttery biscuits. 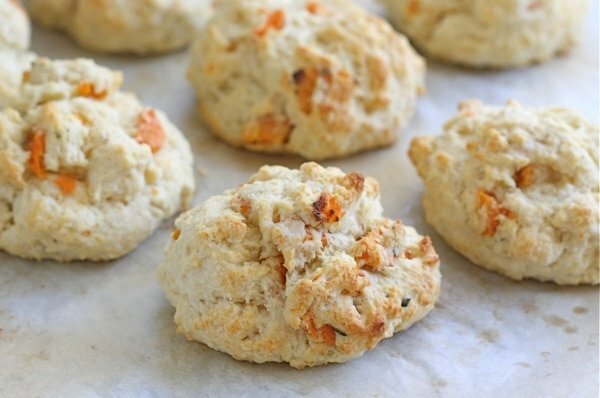 Sweet potato rosemary biscuits are the perfect side dish to any fall meal. Serve them with your favorite soup, salad, or meat dish. They would also be a great addition to your Thanksgiving menu. These sweet potato biscuits are quick and easy to make-you don’t have to worry about yeast or dough rising and they are very tasty! 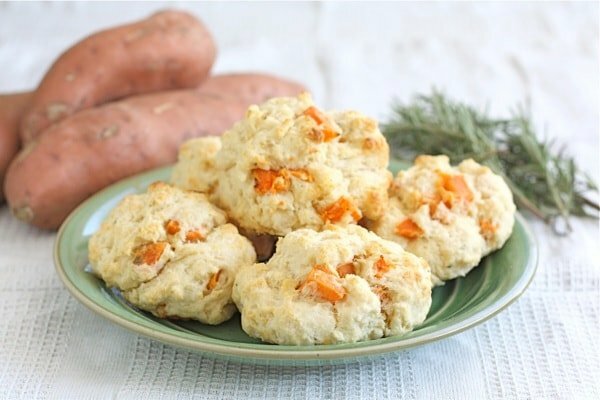 Pile your bread basket with sweet potato and rosemary biscuits this year, your guests will gobble them up. 1. Preheat the oven to 450 degrees F. Line a large baking sheet with parchment paper and set aside. 2. In a large bowl, whisk together flour, baking powder, sugar, baking soda, and salt. Stir in the minced garlic and fresh rosemary. Mix in cold butter with your fingertips until mixture resembles coarse meal. Add roasted sweet potatoes and gently stir. Pour buttermilk over all of the ingredients and stir with a spatula until just combined. 3. Drop round spoonfuls of dough, about four tablespoons, onto prepared baking sheet. Brush biscuits with melted butter. Bake 15-17 minutes or until tops are golden brown. Remove from oven and serve warm. sweet potato is one of my favorite foods, too! these biscuits look so tasty – i’ll be having them this week for sure! We love sweet potatoes too! These sound fantastic. I adore sweet potatoes, and these look so tasty! Great recipe! Charleston’s cafe (my brunch obsession) has the BEST sweet potato biscuits. I’ve been wanting to recreate them at home- you’ve provided a great recipe/inspiration. Wow, I bet these would be a hit at my mother in laws for thanksgiving! What a great combo of flavors! These look delicious! sweat potato biscuits are on my TG list! Love seeing the chunks of sweet potatoes! looks yummy! these look good and festive! Those look delicious, I’ll have to make them sometime. These biscuits look wonderful, Maria! I sometimes have leftover sweet potato from making other dishes, and this would be the perfect way to use it up. Always love your recipes! Thanks for sharing! I love sweet potato biscuits! There is a restaurant on Chincoteague where I go for vacation every summer where I could give or take the food, but I always want to eat there just for their sweet potato biscuits. I haven’t made biscuits in a while since I’ve been on this gluten-free experiment and had my gluten-free biscuits flop and become cookies. I really should give it another shot, particularly as it’s the time of year for sweet potatoes! sweet potatoes are right up there with pumpkin, love them both! These look awesome! What a way to make use of left overs. These look super delicious! Oh, oh, oh, those look absolutely delicious! I love easy sides like this. I honestly have not truly successfully made biscuits yet but I think these are going to have to make it into my rotation. I love anything sweet potato-infused. Gorgeous biscuits, and perfect for fall! mmm, these look great, i love the addition of rosemary! Yum – those look fantastic and soooo satisfying! 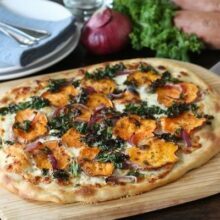 What a great way to use leftover sweet potatoes. They sound fantastic. I didn’t like sweet potatoes growing up, but now I can’t get enough of them! I love all of the flavors in these biscuits! 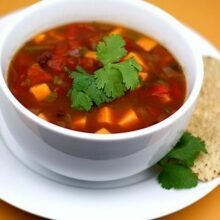 They would be perfect to have when enjoying soups, stews and chili during this chilly weather! I love sweet potatoes too – they are so good in so many different forms! The combo of sweet potato and rosemary sounds so good! I bet these are fabulous biscuits! What a great idea, sweet potatoes and rosemary are a nice combination. I’m going to make these for Thanksgiving. These look so fabulous! Your photos are getting better and better! These look awesome – what a clever idea! I haven’t roasted sweet potatoes before, any advice? They are easy and so good! Thank you!! I can’t wait to make them. Sweet Potatoes are my favorite too Maria! If I could I would have one every day. I also love biscuits and they are a huge weakness of mine. So these sound delicious and perfect for Thanksgiving… or any day for that matter. 🙂 I’m trying these soon. 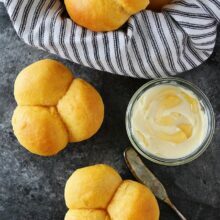 Great way to kick up dinnertime biscuits! Those look delicious! I love sweet potatoes, but only when they’re in a savory dish. These sound fabulous. Great way to add more flavor and color to biscuits. These sound perfect for thanksgiving. Love those bright orange chunks int hese biscuits! They look delicious! These would a wonderful addition to any Thanksgiving feast…and the next morning…and the day after that. Thanks for the link! Yum! In the last few years I have discovered sweet potatoes (always hated them as a kid… not really sure why!) and now they are one of my favorites. Love how you’ve paired them with rosemary in these biscuits! 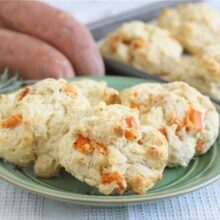 I love how easy drop biscuits are…the addition of sweet potatoes and rosemary sounds great! They look like the perfect biscuit for Thanksgiving! These look awesome! I may just need to try these out as soon as I get off P90x! Or maybe just make them anyway! oh this sounds so amazing! Perfect sweet/savory combo! I made these the other night, and loved the little bit of sweetness and texture difference the sweet potato gave the biscuit. I even posted on my blog about it! Thanks! made these last night, and they were DELICIOUS. thanks for a great, easy recipe! These were great! I didn’t have enough butter, so I probably used about 3T, but they were still delicious. I also had mashed sweet potatoes instead of roasted because I didn’t want to have chunks of them (my husband doesn’t like them). 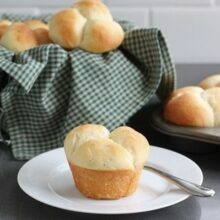 I made these last night after dinner and they were delicious! I had roasted sweet potatoes with rosemary and cranberries in a little olive oil for dinner then used the left overs for the biscuits. The cranberries were a bonus. My husband loved them and requested them for Thanksgiving. Thank you for all the wonderful recipes. Love these made them twice already, but you call them sweet potatoes and it looks like you used yams to make them I used sweet potatoes there is a difference.